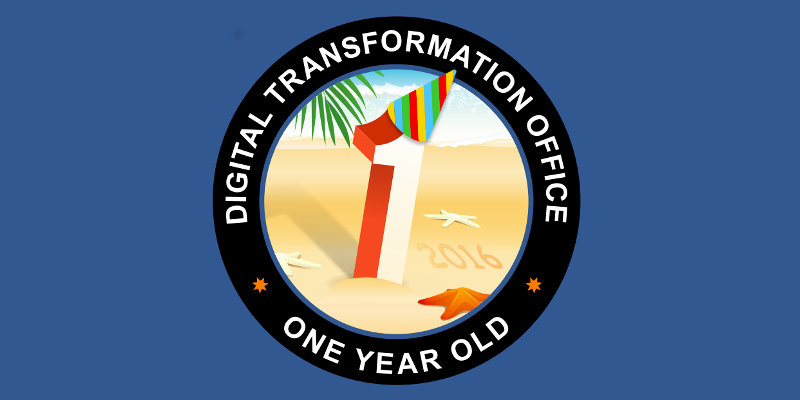 Earlier this month DTO celebrated its first birthday, and what a journey it has been! Our CEO Paul Shetler looks back and takes us through the highlights and milestones of our first year. When I joined the DTO a year ago, it became clear very quickly that the expectations on this agency were really, really high. As a brand new organisation, we had a lot to do to get up and running. The DTO has been asked to work with departments and agencies to make government services better for the Australian people. I think we’ve made a great start. created the Digital Service Standard, the benchmark for measuring good digital service delivery. Over the course of the year, we’ve tested it with agencies across government, and improved it by introducing in-flight assessments. The Standard is now Live and being adopted across government. The Department of Human Services has improved the Medicare enrolment process. The Department of Immigration and Border Protection has created an online citizenship appointment booking service, and introduced digital permits to simplify the process of importing goods. The ACT Government has made it easier to book outpatient appointments. The Department of Industry, Innovation and Science has made it easier to start a business. released an Alpha prototype of GOV.AU, demonstrating how government services and information could be brought together into one place. Work on the Beta of GOV.AU is now well underway - we’re looking forward to sharing more on this soon. delivered an Alpha of the Performance Dashboard, a platform to make it easier and clearer to see how well government services are performing. completed Alpha on the Digital Marketplace, making it easier for businesses of all sizes to work with government to deliver digital services. We’re now working on the Beta. onboarded our first services onto cloud.gov.au, a simpler and faster way for government services to release and operate services on cloud infrastructure. grown communities of practice for service design and content design, so that practitioners across government can learn from each other. signed a Memorandum of Understanding with the Government Digital Service in the UK, to strengthen our relationship and make it easier to work together. It’s been a busy 12 months. It hasn’t always been easy. It’s also important to remember that we aren’t doing this alone. We’re working in partnership with departments and agencies across government to get there. Happy Birthday DTO! Here’s to another great year.